Izadi, N., Naderi Nasab, M., Harifi Mood, E., Meshkat, Z. (2017). The Frequency of qnr Genes in Extended-Spectrum β-lactamases and non-ESBLs Klebsiella pneumoniae Species Isolated from Patients in Mashhad, Iran. Iranian Journal of Pathology, 12(4), 377-383. Nafiseh Izadi; Mahboubeh Naderi Nasab; Elnaz Harifi Mood; Zahra Meshkat. "The Frequency of qnr Genes in Extended-Spectrum β-lactamases and non-ESBLs Klebsiella pneumoniae Species Isolated from Patients in Mashhad, Iran". 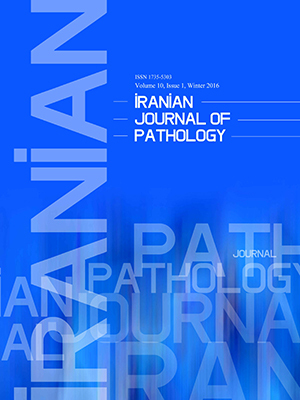 Iranian Journal of Pathology, 12, 4, 2017, 377-383. Izadi, N., Naderi Nasab, M., Harifi Mood, E., Meshkat, Z. (2017). 'The Frequency of qnr Genes in Extended-Spectrum β-lactamases and non-ESBLs Klebsiella pneumoniae Species Isolated from Patients in Mashhad, Iran', Iranian Journal of Pathology, 12(4), pp. 377-383. Izadi, N., Naderi Nasab, M., Harifi Mood, E., Meshkat, Z. The Frequency of qnr Genes in Extended-Spectrum β-lactamases and non-ESBLs Klebsiella pneumoniae Species Isolated from Patients in Mashhad, Iran. Iranian Journal of Pathology, 2017; 12(4): 377-383. 1Student Research Committee (SRC), Mashhad University of Medical Sciences, Mashhad, Iran. 2Antimicrobial Resistance Research Center, Mashhad University of Medical Sciences, Mashhad, Iran. Background and Objectives: Since the fluoroquinolones are the broad-spectrum antibiotics, they affect both Gram-negative and Gram-positive bacteria. These antibiotics are widely prescribed by physicians. As a result, some bacteria, especially Enterobacteriaceae, have shown a resistance to this family of antibiotics. The current study aimed at detecting the frequency of qnrA, qnrB, and qnrS genes, novel plasmid-mediated quinolone-resistance genes, among extended-spectrum β-lactamases (ESBL)-positive and ESBL-negative Klebsiella pneumoniae isolates. Materials and Methods: One hundred and thirty isolates of K. pneumoniae were collected from Imam Reza Hospital and its associated clinics from May 2011 to July 2012. The isolates were tested for ESBLs by the conventional methods. Polymerase chain reaction (PCR) was performed to amplify qnr A, B, and S.
Results: Thirty-eight (29.3%) isolates were ciprofloxacin-resistant. Among 130 K. pneumoniae infectious isolates, 56 (43%) were capable of producing ESBL; 10.8% (n=14), 15.4% (n=20), and 20.8% (n=27) of ESBL-producing K. pneumonia were positive for qnrA, qnrS, and qnrB, respectively, and 13.8% (n=18) of the isolates harbored 2 or 3 qnr genes. Conclusion: The results of the current study showed that quinolone-resistance genes were more frequent in ESBL-producing K. pneumoniae (37.5%) isolates, compared with the ESBL-negative isolates (20.89%). The prevalence of qnr genes was high in K. pneumoniae isolates, with higher frequency in ESBL-positive strains. Most of the isolates were positive for all 3 groups of qnr genes and the qnrB was the most common one. Fluoroquinolones are the broad-spectrum antibiotics and affect both Gram-negative and Gram-positive bacteria. Their widely administration to treat bacterial infections led to increase in antibiotic resistance, especially among Enterobacteriaceae. Three mechanisms of resistance to quinolones are as follows: 1) Chromosomal mutations that modify the activity of DNA gyrase and DNA topoisomerase IV; 2) Overexpression of efflux pumps, which in turn decreases drug accumulation; and 3) Plasmids that carry qnr genes and are transferable from one bacterium to another (1-5). The qnr genes produce Qnr proteins (Qnr A, B, and S), which protect DNA gyrase from quinolone inhibition. The plasmids may also carry the genes encoding extended-spectrum β-lactamases (ESBLs) such as SHV, TEM, CTX-M, KPC-2, aac(6')-Ib-cr and AmpC genes (6-10). ESBLs confer resistance to a wide variety of cephalosporins (one of the most widely used drugs to treat bacterial infections). This resistance is brought by β-lactamase enzymes produced by a variety of bla genes such as SHV, TEM, CTX-M, KPC-2, aac(6')-Ib-cr and AmpC and the presence of qnr genes in the strains producing ESBLs. Firstly, plasmid-mediated quinolone-resistance was reported in the clinical isolates of Klebsiella pneumoniae (K. pneumoniae) from the USA in 1998(11). K. pneumoniae is capable of producing ESBLs and is a common cause of nosocomial infections. The coexistence of these 2 groups of genes (qnr and bla) in these bacteria is an issue for physicians or health care workers in hospitals. The spread of these strains increases the mortality, especially in the elderly and infants with compromised immune responses (12, 13). The high prevalence of qnr genes were reported in different regions of the world (14). The prevalence of qnr genes in K. pneumoniae species was reported 48.9% in Malaysia (15), 40.5% in Korea (16), and 11.1% in the United States (17). There is limited information on the prevalence of these genes in Iran. Therefore, the current study aimed at evaluating the prevalence of new plasmid-mediated quinolone-resistance genes, qnrA, qnrB, and qnrS, among ESBL-positive and ESBL-negative K. pneumoniae isolates. The current cross sectional study was conducted at Imam Reza Hospital in Mashhad, Iran. The study protocol was approved by the Ethics Committee of Mashhad University of Medical Sciences. One hundred and thirty isolates of K. pneumoniae were collected from May 2011 to July 2012. Clinical samples including urine, blood, wound culture, and cerebrospinal fluid (CSF) were processed in the current study. Antimicrobial susceptibility for ciprofloxacin, ceftazidime, cefotaxime, and cefpodoxime were assessed for the ESBL-producing Escherichia coli (E. coli) and non-ESBL-producing E. coli, by the standard disc diffusion method according to the Clinical and Laboratory Standards Institute (CLSI) guidelines (18). Isolated E. coli were cultured on Mueller-Hinton agar, and ciprofloxacin (5 µg), ceftazidime (30 µg), cefotaxime (30 µg), and cefpodoxime (10 µg) disks (Mast, UK) were placed on the inoculated plates and incubated at 35°C for 16 to 20 hours. Resistance to the studied antibiotics was assessed according to the growth inhibition zone sizes, compared with the CLSI breakpoints for Enterobactericeae (18). Phenotypic production of ESBL was determined by the combination disc method. According to CLSI guidelines, the bacteria were cultured on Mueller-Hinton agar, and ceftazidime (30 μg) versus ceftazidime/clavulanate (30/10 μg), cefotaxime (30 μg) versus cefotaxime/clavulanate (30/10 μg), and cefpodoxime (10μg) versus cefpodoxime/clavulanate (30/10 μg) disks (Mast diagnostics, UK) were placed on the inoculated plate by 20 to 30 mm distance from each other. After 18 to 24 hours of incubation at 37ºC, ESBL-producing organisms were detected by increase of the inhibition zone diameter by at least 5 mm around antibacterial agents in combination with clavulanic acid (18). The reference strain, K. pneumoniae ATCC 700603, was used as an ESBL-positive control. Two to three colonies of bacteria were resuspended in a 500-µL of sterile distilled water. Suspensions were heated at 100°C for 15 minutes. Then, they were centrifuged at 3000 g for 10 minutes for the precipitation of cell debris. The supernatant was transferred to a new microtube and stored at -20°C (19, 20). The polymerase chain reaction (PCR) was performed by the specific primers for target genes (as shown in Table 1). Master mixes were prepared for each gene separately. Each contained 2 µL of 10X PCR buffer, 1.75 mM of MgCl2 50 mM, 200 µM of each 10 mM dNTPs, 1 U of Taq DNA polymerase enzyme, 500 nM of each primers qnrB/A (10 µM) and 400 nM of each primers qnrS (10 µM) in the total volume of 20 µL. Two microliters of DNA was added into the reaction mixture to amplify each of the qnr genes. Amplification program for qnrA was 5 minutes at 94°C followed by 35 cycles of 30 seconds at 94°C, 45 seconds at 50°C, and 45 seconds at 72°C; and a final extension at 72°C for 5 minutes. The program for qnrB was 5 minutes at 94°C followed by 35 cycles of 30 seconds at 94°C, 45 seconds at 53°C, and 45 seconds at 72°C; and 5 minutes at 72°C as the final extension. For qnrS, it was 2 minutes at 94°C followed by 35 cycles of 45 seconds at 94°C, 45 seconds at 55°C, and 45 seconds at 72°C, and 10 minutes at 72°C as the final extension. Amplicons were run on 1.5% agarose gel and the final product was stained with Green Viewer (Pars Tous, Iran). Seventy-nine (60.8%) of the 130 isolates were positive for qnr genes. 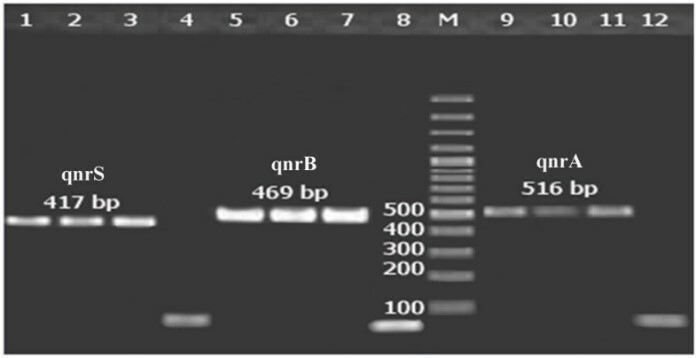 The qnrA, qnrS, and qnrB were detected in 14 (10.8%), 20 (15.4%), and 27 (20.8%) isolates, respectively (as shown in Figure 1); 18 (13.8%) isolates possessed more than one qnr gene. The qnrB gene was the most common type of qnr genes; 56 (43%) isolates were capable of producing ESBL as evaluated by the confirmatory phenotypic test. The distribution of qnr genes in the clinical isolates of ESBL-KP and non-ESBL-KPs are shown in Table 2. Figure 1. PCR results for qnrA, B, and S genes. Lane numbers 1, 2, and 3 show a 417-bp fragment of qnrS. Lane numbers 5, 6, and 7 show a 469-bp fragment of qnrB. Lane numbers 9, 10 and 11 show a 516-bp fragment of qnrA. Lane M represents a 100-bp DNA marker. Lanes 4, 8, and 12 are the negative controls. Totally, 88.6% (70 of 79) of the qnr-positive species were isolated from inpatients and 39(49.4%) isolates were positive for ESBL (as shown in Table 3). Overall, out of 92% of the species isolated from inpatient samples, which were qnr-positive ESBL-positive K. pneumoniae, 64.2% were isolated from males and 35.8% from females. In the qnr-positive ESBL-producing K. pneumoniae isolates, 25% (10 of 39) possessed two qnr genes, and two isolates harbored three qnr genes. The results are shown in Table 3. According to the data shown in Table 3, fifteen ESBL-positive species were isolated from subjects under five years old. Also, eight isolates were positive for qnr genes. According to the results of the current study, 37.5% of ESBL-positive and 18.9% of ESBL-negative K. pneumoniae isolates were resistant to ciprofloxacin. Four of the ciprofloxacin-resistant ESBL-producing isolates and seven of ciprofloxacin-resistant non- ESBL-producing isolates had no qnr genes. Twenty-seven of 40 qnr-positive/ESBL-negative isolates, and 13 of 39 qnr-positive/ESBL-positive isolates were sensitive to ciprofloxacin. The qnrB, followed by qnrS and qnrA, was more prevalent in K. pneumoniae isolates. K. pneumoniae capable of producing ESBL is a concern both in the treatment and management of nosocomial infections. Plasmid-mediated antibiotic-resistance can easily be transferred between bacteria, which increase drug resistance in bacteria. Consequently, it may result in a high mortality rate among patients infected with such bacteria. In the current study, 37.5% (21 of 56) of ESBL-positive K. pneumoniae isolates were resistant to ciprofloxacin. The prevalence in the current study was higher than that of the study by Shahcheraghi (32%) (21), while it was lower than those of other studies by Wang et al. (42%), Robicsek et al. (69%), and another study by Wang et al. (73.9%) (6, 17, 22). In a similar study conducted in Mashhad, Iran, the prevalence of ESBL-producing E.coli was high, especially in hospitalized patients (26). Furthermore, in a recent study performed in Mashhad, the most prevalent gene among all ESBL-producing E.coli isolates was qnrA, followed by qnrB, and qnrS (26). In the current study, qnr genes were observed in 60.8% of K. pneumoniae isolates based on PCR findings. Compared to the results of the current study, the prevalence of qnr gene was higher in the studies carried out in China by Wang et al. (22.4%) and Jiang et al. (16.2%), in Korea by Kim et al. (40.5%), in Poland by Piekarska et al. (8.3%), and in Spain by Briales et al. (3.7%) (6, 7, 16, 23, 24).The current study results were lower than that of Richter et al. (68%) in Italy (25). In the current study, qnrB (32.31%), followed by qnrS (26.15%) and qnrA (19.23%), was more prevalent in K. pneumoniae isolates. In the studies by Wang et al., Jeong et al., Kim et al., and Piekarska et al. (6, 16, 23, 26), similar to the current study, qnrB was the most prevalent genotype. However, the most prevalent qnr gene in the studies carried out by Le et al., Jiang et al., and Wang et al. (7, 22, 27) was qnrS. Robicsek et al., showed that (17) qnrA was the most prevalent genotype. In the study by Wang et al. (6), similar to the current study, qnrA had the lowest prevalence. In the current study, 40 out of 74 ESBL-negative isolates were positive for any of the three qnr genes. The qnrA and qnrS were more prevalent in ESBL-negative isolates, compared with ESBL-positive isolates. The qnr genes were not found in 4 of 21 ciprofloxacin-resistant ESBL-positive isolates, and 7 of 14 ciprofloxacin-resistant ESBL-negative isolates. This may be due to chromosomal-mediated quinolone-resistance in the bacterial. Thirteen of 39 (33%) qnr-positive ESBL-positive isolates were sensitive to ciprofloxacin. Almost similar to the results of the current study, Saiful Anuar et al., found qnr genes in 7 (38.9%) sensitive isolates (15); however, these isolates were resistant to gentamicin or/and co- trimoxazole. Eighteen percent of ciprofloxacin-sensitive species isolated from wound specimens with mixed infection harbored qnr genes (11). In the current study, qnr genes were found in 8 out of 15 ESBL-positive K. pneumoniae species isolated from children. This result was consistent with that of Wang et al., which reported the rate of 11.9% (8 of 67) (22). Since quinolones are not recommended for children, acquisition of qnr-positive strains may occur via horizontal transmission by parents or via strains carrying transferable plasmids containing bla genes linked to qnr genes, which are acquired from hospital or other reservoirs (such as animal and agricultural products). In the current study, the prevalence of qnr among the clinical isolates of K. pneumoniae was 60.8% (79 out of 130). The current study indicated that among quinolone-resistant K. pneumoniae strains, ESBL-positive isolates were more prevalent that ESBL-negative ones. This could happen as a result of insertion in the same plasmid, which could in turn be easily transmitted to other microorganisms and increase the number of multidrug resistant isolates. High prevalence of quinolone-resistant genes among bacteria at Imam Reza Hospital of Mashhad is a major concern. Hence, antibiotics prescription pattern should be revised and the infection control measures should also be improved. The current study was supported by the Student Research Committee (SRC), Mashhad University of Medical Sciences, Mashhad, Iran (Grant No. 901120).